Open4rent Pty Ltd is a private company, working towards becoming a social enterprise, based in Indooroopilly, Queensland, Australia. We provide online real estate advertising services to promote residential and commercial real estate for rent, for lease, or for sale. In other words, Open4rent connect tenants and buyers with property owners, managers and agents. You start a business thinking this is the idea, this is what we can do for people, then you look back two years later and realise how much it has evolved and developed from its initial concept! First, we noticed a lack of choice in the rental market. There were a lot of rentals available but they were hard to find. Then we saw a growth in more expensive housing prices and rental prices. While there was a growing lack of affordable housing. Consequently this was having a negative impact on people looking for homes. Resulting in people struggling to find homes they could afford, as well as accessible homes, furnished homes or pet-friendly homes. For that reason we decided to start a business which would provide inclusive real estate advertising. Developed for everyone, we provide cost-effective and quality online real estate advertising for rental properties, commercial properties and residential homes throughout Australia. Therefore, whether you are selling or managing your property privately or with an agent/property manager, everyone is welcome to advertise their real estate with Open4rent. We want Open4rent Pty Ltd and it’s real estate advertising portal including RentEzy, LeaseEzy and SellEzy to add to the industry, connecting more people with real estate that meets their needs. We take full responsibility for the control of the technology, developing our platforms internally. After two years of planning and two soft launches, we finally had a product. But we also wanted Open4rent Pty Ltd to have a real purpose in the community! 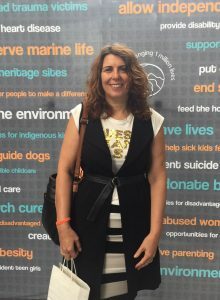 Volunteering for Orange Sky Australia in 2018 changed everything! Homelessness in Australia is growing. Open4rent Pty Ltd was started with the dream of connecting more people with homes. This grew to include our social enterprise focus of building affordable housing. It was after Lynda started volunteering with Orange Sky Australia and went to a Change the World Conference in Brisbane, that she found the information and connections to start turning Open4rent’s purpose into a reality. Doing laundry for friends who live with homelessness made Lynda realise how important it was for Open4rent to do more. People living in their cars, sleeping rough or in temporary accommodation deserve to have homes. Too many times Lynda was hearing the same story about choices. Homeless friends would tell Lynda do I rent a home I can’t afford and not have a car or means to work; or do I live in my car and have money for petrol and food, and work? Lynda realised Open4rent had to become a social enterprise. We needed to find a way to fund and develop affordable housing. Profits from Open4rent could contribute to the development of affordable housing. But that meant we needed to think bigger, provide a broader range of services. And so the Open4rent Real Estate advertising portal was established to provide three portals for advertising and accessing real estate properties. Open4rent found its purpose and heart! for rent or sale, residential or commercial. Homelessness can happen so quickly in today’s society! The loss of a job, separation with spouse/partner or illness can see someone end up homeless in a matter of weeks. Make a difference to the lives of people around the world. To connect more people with real estate through providing choices. in providing opportunities for others to find happiness and prosperity including tenants, business owners, private property owners, private landlords, managers, agents and our team. Open4rent is working towards becoming a hybrid organisation and operating as a social enterprise. Our aim is to reduce homelessness through affordable housing. We want to provide affordable housing for people sleeping rough, living in their cars or living in temporary accommodation. You might say we are a “robin hood organisation”. Taking profits from the Open4rent Real Estate Advertising Portal and using it to fund affordable housing projects. The affordable housing projects we implement will be partially or fully funded by the corporate side of Open4rent Pty Ltd.
We provide three platforms for homeowners, property investors, property managers, and agents to advertise residential and commercial real estate properties for rent/lease or sale. Our innovative advertising services allow you to upload a real estate advertisement (listing) in minutes including 12 images, video, 360 degree images, location, extensive details and more. Contributing to community as we move towards becoming a social enterprise is at the heart of what Open4rent does. We will support other not-for-profit organisations who assist the homeless. Providing a diverse range of online real estate advertising services to help connect families and businesses with the right home or premise, in the right location at the right price. Open4rent, Managing director, Lynda Galway attending the Change the World Conference Brisbane 2018. As a volunteer for Orange Sky Lynda is learning constantly about the struggles of people living on the streets. That’s why she dreams of Open4rent becoming a social enterprise and making a difference by developing affordable housing. Our sales team will show you how Open4rent can support you to achieve your real estate goals. Our customer support team provides telephone technical support to ensure to assist you to use its advertising portals. Our administration team will assist with inquiries relating to corporate information and accounts.